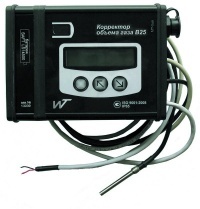 Intended to measure the quantity of natural gas, as well as single and multicomponent gas mixtures. 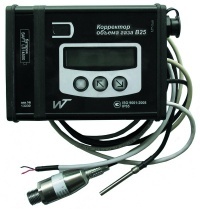 Used with gas meters with pulse output for calculating the actual gas consumption, reduced to standard conditions with regard to the existing operating temperature, pressure and gas composition. Produced since 2002, registration No U1626 in the State Register of measuring instruments, calibration interval - 2 years. Structural performance of the corrector B25: single or dual (two correctors in a calculator); corrector temperature modification of T, the limit of the relative error of ± 0,10%; correctors of temperature and pressure: PT1 and PT2 modification, T, relative error limits, respectively, ± 0,50%, ± 0,25%, ± 0,15%. angle sensor output shaft of the gas meter.